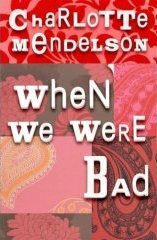 Well I loved When We Were Bad, cover to cover over a long sleepless coughing night and a bed-ridden day and the time just flew.Jessica's written about it with enthusiasm over on The Book Bar too. Adam at Crockett & Powell went one better, or actually about a hundred better, and found himself in the company of Charlotte Mendelson at the dinner held by Macmillan to celebrate the book, which will be published here in May. "The Rubin family, everybody agrees, seems doomed to happiness"
Rabbi Claudia, slightly down-trodden husband Norman and their grown-up children Leo, Frances,Emily and Simeon and just prepare to hunker down for a slice of life with this most traditional of Jewish families. Expect everything to be as tightly controlled as Claudia can keep it all as she ministers to both her family and her congregation at the New Belsize Liberal Synagogue and then expect it all to go hopelessly pear shaped.From the non-wedding of eldest and favoured son Leo to the Passover Seder gathering which year on year Claudia organises with military precision, "Day 4 Norman Gets Dishes From Loft" style. There are moments of great humour and also great poignancy as the world she attempts to control crumbles at Claudia's fingertips and all against a backdrop of her latest book which it's planned will set a moral code for the nation to live by.Poor Claudia can only sit by and watch helplessly as her own family go off on a frolic of their own, however they are all late twenty-thirty somethings so it's not before time. Great insights into Jewish family life and the humour just rolls off the page without trying too hard, it's a deft touch that works. When We Were Bad deserves to do well, I can only hope no one sent a copy to David Baddiel for review or there'll be hell to pay.